Do my eyes deceive me, or is that a countdown to a new Carmageddon game I see? A little history lesson for you kids out there. 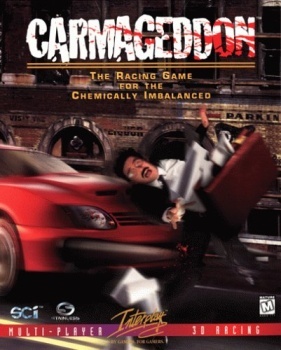 In 1997, Stainless Games, SCi and Interplay came out with Carmageddon, "the racing game for the chemically imbalanced," in which victory could be earned by being the first across the line, destroying the other cars in the race or killing every pedestrian in the level. And they killed real good, let me tell you, with plenty of blood, guts and splatter on the windshield. A few countries [we're looking at you, Germany] actually censored the game, turning the pedestrians into zombies that spurted green liquid when hit, or banned it outright. If you will turn your attention to Carmageddon.com, you will notice a countdown timer, currently down to 11 days, 15 hours and change. What happens when it hits zero? I have no idea but I assume it will involve a catastrophic coming-together of 600 screaming horses and an old lady with a walker. And it will be awesome! It could be something else, I suppose, but I can't imagine what. I will also take this moment to say that if it turns out to be a top-down iOS-exclusive game, I am going to be supremely disappointed. We'll keep you posted!